St Mary Magdalene and its churchyard contain many memorials to people who made major contributions to our world. But, sadly, their stories have faded from memory. In this article, Paul Springford tells us about one man who literally put Stilton on the map. When Queen Victoria came to the throne in 1837, if you had walked up Caldecote Hill and looked out across the Fens, you would have seen not a railway line – and certainly no motorway – but a lake about three miles across in the distance. This was Whittlesea Mere and you could reach it by boat from Stilton. But just twenty years later the view had changed dramatically. The railway had arrived and the lake had been replaced by fields; farmers had replaced fishermen. 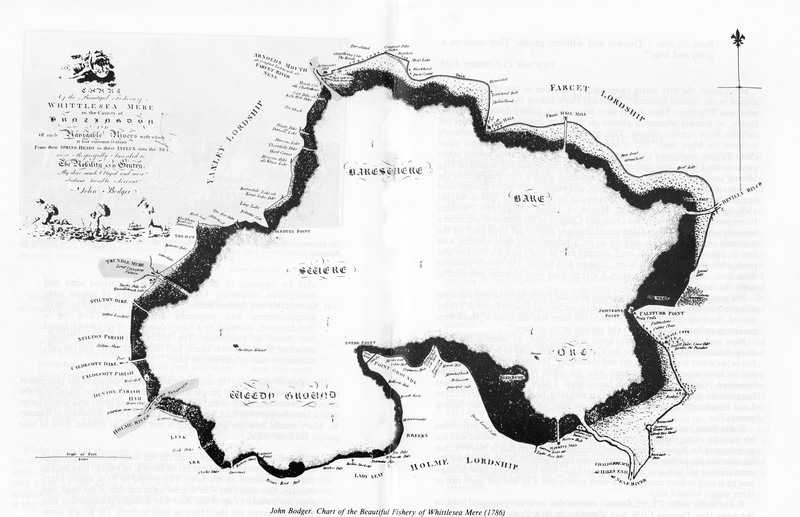 In 1786 John Bodger, a local land surveyor, published the most detailed map we have of Whittlesea Mere before it was drained in 1851. Printed on satin or calfskin, it was over two feet (60 cm) wide and cost one guinea (£1.05); over £150 in today’s money. A paper version cost half a guinea. The map was widely purchased at the time and is today a key historical document. Perhaps encouraged by the success of this map, John published a number of other engravings, mostly connected with horse racing at Newmarket and including a detailed plan of the race course. So who was John Bodger? John Bodger was the son of a farmer called Samuel. His mother, Mary, died in 1760 aged 38. Samuel’s second wife, Bridget, died in 1781 aged 30. Both Mary and Bridget bore numerous children who died in childhood. Unusually, John and his younger brother Richard both survived and lived to about 90 years of age. John lived in a handsome three-storey house in Church Street with his wife Mary. As far as we know, they had no children. Mary died in 1836, and John lived there with his widowed niece Hannah Palliser until he died in 1843. We don’t know when he moved in, but we do know that he was involved in a legal dispute about the ‘nuisance’ (the smell) caused by the ‘shambles’ (butchers’ stalls and slaughterhouses) on the opposite side of the road. For generations – and smelling much more agreeably – this house has served as Stilton’s village shop. Like his father before him, John was a churchwarden, serving between 1794 and 1796. He signed the parish records, which include the baptisms of a number of children whose fathers were in the militia and serving at the Norman Cross prisoner of war depot during the Napoleonic period. In the churchyard, not far from the south door, an elaborate memorial stone commemorates John and Mary, his parents and stepmother, and some of his brothers and sisters. Nearby, a small footstone shows John and Mary’s initials and 1836, the year of her death. Today, the Great Fen Heritage Group, a voluntary group interested in the history, archaeology and ecology of the Whittlesea Mere area, is raising funds to enable the Bodgers’ headstone to be restored to its proper upright position so that its historical and aesthetic significance can be properly appreciated. And the Fenland Trust, a local organisation which promotes understanding of our area’s heritage, is interested in placing a commemorative plaque for John Bodger in his home village.